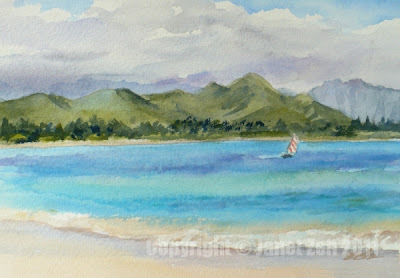 I painted this lovely watercolor seascape at the beach. It was very windy since Kailua Bay is on the windward side of the island - the east coast. So all the colors in my little palette became full of sand no matter how hard I tried to shield them from the wind. Actually, it did not matter that I was using sandy paints. Oahu's beach sand is incredibly clean and white which is partly why the colors of the water are so intense. As the paint dried, the wind blew the sand particles off the paper. You cannot tell there was sand there at all! I am giving the original painting to my sister with whom I traveled. It is her favorite of those I've painted so far. The original watercolor is sold. Ask about having one painted especially for you. I can also make a print, contact me for sizes and prices.